With new investment to modernize and expand Metrobús, Mexico City is making high quality sustainable mobility a reality for its residents. Photo by Taís Policanti/EMBARQ Mexico. With a metropolitan population of more than 21 million people—and growing quickly—Mexico City faces distinct challenges in delivering sustainable urban mobility. Whether to combat a long history of urban sprawl or to meet the mobility needs of different communities, the city has had to innovate throughout its history to help residents move safely and efficiently. Today, Mexico City is stepping up its vision for sustainable mobility. With the support of leading development banks and urban mobility experts, the city will invest $150 million in expanding and modernizing sustainable public transport systems. This investment ranks among the largest in sustainable mobility in Mexico City’s history, and is a significant step forward in orienting the city around people, not cars. If the initiative achieves its goals, it will improve mobility, accessibility, and quality of life for millions of chilangos. Already, Mexico City boasts some of the most effective sustainable transport modes of any city in the world. The Metrobús bus rapid transit (BRT) system, for example, serves nearly one million people every day. The system was the first of its kind in Mexico, with eight cities launching BRT systems of their own since Metrobús opened in 2005. But leaders know this is not enough. Even though public transport accounts for more than 57 percent of all trips within the Federal District, car ownership is rising and reached 3.5 million in 2010. Congestion costs the city 2.6 percent of GDP every year, deteriorating air quality has become a major threat to public health, and public opinion of transport services—particularly of the city’s 29,000 microbuses—is declining. As it stands, these microbuses serve 60 percent of public transport trips within the city, but are unregulated, inefficient, and a major source of pollution. For this reason, a key goal of the initiative announced today is to transform the operational, regulatory, and financial model of the microbuses to improve quality of service. To achieve this, the city will restructure the system—with technical support from EMBARQ Mexico—and fundamentally change the way microbuses are managed. This change is one that residents have been asking for: in a 2012 survey, 64 percent of respondents found the microbuses unsafe, while 48 percent found them too expensive. Taking today’s chaotic and fragmented system and transforming it into one that meets residents’ mobility needs will be an important long-term focus. The end result will be a more efficient, user-friendly system that also incorporates energy-efficient vehicles to replace existing microbuses, most of which are more than 20 years old. These new energy-efficient buses will further decrease air pollution and greenhouse gas emissions, complementing the 122,000 tons of carbon dioxide emissions Metrobús already avoids every year. This will help the city build on the success of Metrobús, the world’s sixth largest BRT system, which will also receive funds to expand Lines 5 and 6 under this initiative. 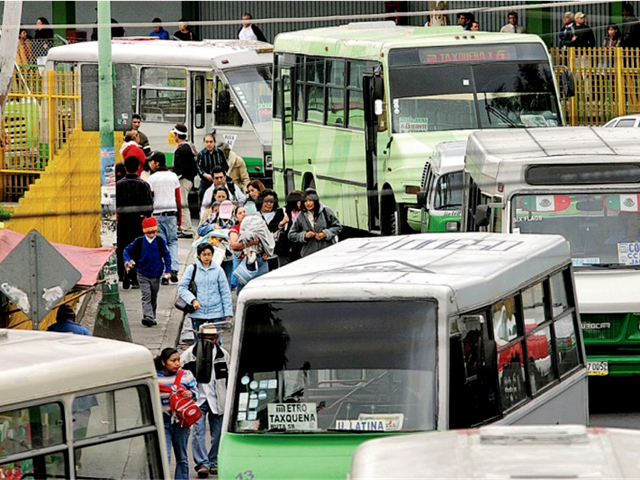 Mexico City currently has more than 29,000 microbuses in operation. Most of these are more than 20 years old and are major contributors to traffic congestion and air pollution. Photo by EMBARQ Mexico. Reforming microbuses and expanding Metrobús both play important roles in shaping a more economically competitive and environmentally sustainable Mexico City, but they’re not the only solutions the city is pursuing. Building on a promise to guarantee the “right to mobility” through legislation passed last year, Mexico City’s leaders are also scaling up efforts around public bike sharing, supporting car-free days for health and recreation, and reclaiming streets for pedestrians. The ECOBICI public bike sharing program currently has more than 6,500 bikes in operation throughout the city and prevented the emission of an estimated 232 tons of carbon dioxide equivalent in its first three years of operation. Muévete en bici weekly car-free days have attracted more than one million visitors in their seven year history. And finally, pedestrianization of the city’s historic center is improving accessibility and supporting local businesses while taking cars off the road. These initiatives—together with a rejuvenated fleet of microbuses and a world-leading mass transport system in Metrobús—put Mexico City firmly on the path to a sustainable future. While there is more work to be done to ensure that the pace of innovation matches the pace of change in the city, $150 million for more efficient, people-oriented urban mobility can go a long way towards making Mexico City more livable and sustainable. Learn more about EMBARQ Mexico’s role helping Mexico City transform the microbus system here. 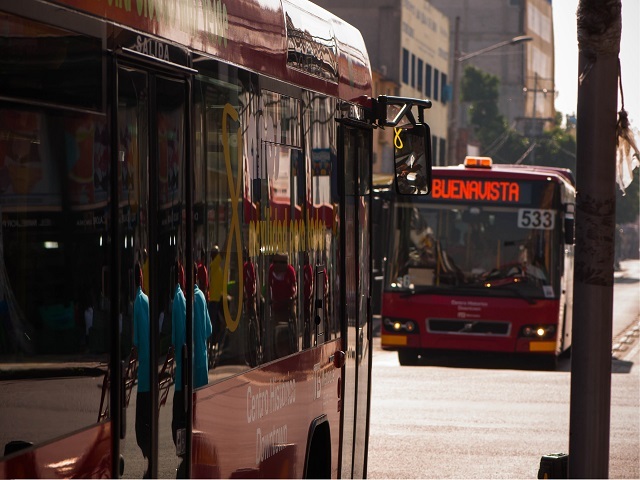 Editor’s note: a previous version of this article listed the amount of carbon dioxide emissions Metrobús eliminates as 35,000 tons per year. This has been updated to reflect the most recent data.